One of the reasons I love summer is all the grilling we get to do, so the latest dinner party extravaganza with my partner in crime, YT, was a celebration of all things grilled. We're talking tandoori chicken, lamb kebabs, figs, sliders, squid, shrimp and avocado, to name a few. It was fantastic, if I may so myself, not least because I love charred food that's actually bad for me and it was probably the most stress-free dinner party I ever held. Everything I made was for the first time except Tyler Florence's burgers that I had made before to much success. The grilled avocado salad was probably the biggest revelation for me. One, I had never grilled, or thought of grilling avocados. Split it half, removed pit, brush with oil and grill face down on the wonderful charcoal grill courtesy of YT. Who knew avocados could be smoky? It helped that the corn was also grilled and hence smoky. It was actually a twist on the humble Caesar salad, except the dressing was spiked with canned chipotle peppers in adobo sauce. The charred avocado gave way to the creamiest interior with all its nutty glory. 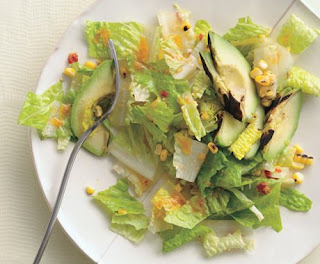 The grilled avocados, corn and romaine lettuce blended beautifully to create a whole new kind of Caesar salad. Loved it. Another thing I love is a burger -- bloody patty with a soft bun that can hold its own. 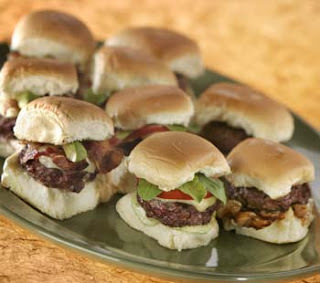 How could I pass up the opportunity to devour fresh, off-the-grill sliders? I whipped out a great horseradish and Havarti burger recipe by Tyler Florence. The guy has the best recipes. His stuff always come out delicious. Anyhow, the patties are mixed in with some horseradish (I used the "prepared horseradish" cream in a jar) and chopped chives and voila, topped with melting Havarti, makes one mean slider. The horseradish helps to make the (15% fat ground chuck) patty softer and more moist. Just halve the burger recipe and you get twice as many sliders. You can use dinner rolls as buns. The works include bacon (which you know I find distracting but I don't judge), butter lettuce, tomato and red onions. Some of the guests had it open-faced, just with one bun, if you're carb-conscious or gearing up to eat more. I toasted the buns lightly on the grill before assembling. I baked some potato and sweet potato wedges in place of french fries and while they weren't crunchy, they did their job nicely. I volunteered to grill some seafood or shellfish so went with squid and shrimp. The grilled squid salad was very refreshing. I seasoned the squid in chili pepper, cumin and cayenne so the squid had much flavor by the time it hit the grill. The grilled red bell peppers, red onions, spinach and chopped mango smothered in lime juice gave the salad a tangy, sweet and smokiness that complemented the hot morsels of squid coming off the grill very well. 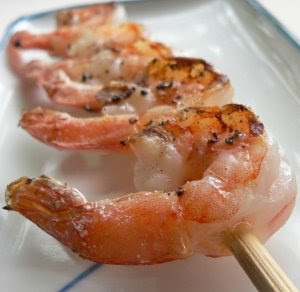 I used a Bobby Flay recipe for the shrimp and they were just "eh." I was never a big fan of his, but I've always been curious about his very colorful sauces and marinades squirting out of his many sauce containers. So I emulated his Habanero-Garlic vinaigrette that wasn't half bad, but the grilled shrimp was not as flavorful. The host of the party threw figs, chicken and lamb on the grill to delicious effect. 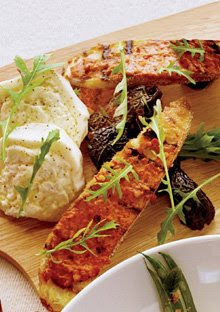 The figs (recipe from O magazine) were halved, grilled face-down and consumed with the creamiest and decadent burrata cheese. As if that weren't enough, we had the option of topping it with a nutty and delicious romesco sauce from Spain. The slightly caramelized figs were amazing by themselves, and paired with the burrata, straight up out of this world. The chicken was marinated in a mix of spices and yogurt and offered with basmati rice. The chicken was moist and extremely flavorful. The lamb kebabs were a mix of ground lamb, spices, herbs and pine nuts that took us to an aromatic voyage to the middle east. Again, juicy interior meets charred exterior = heaven! 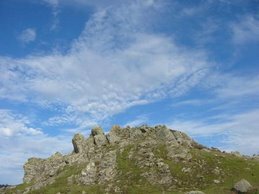 With home-made mojitos and super-cold ice wine flowing, it was a great way to celebrate what was supposedly summer solstice, midsummer -- or the longest day of the year. The host also served a rocking blueberry crumble a la mode to finish off the meal. PS: I made very good use of the leftover chicken by slicing them at a bias and placing a few slices in lettuce cups and topping them with some mint chutney to continue the Indian theme. They were not as good as that evening but good nevertheless. I went. I ate. I conquered. The culinary high point of my trip to SF was probably a nice outdoor dinner at Pizzaiola in Oakland, with not one but two rainbows blessing this delicious meal. I know this isn't a news flash -- the chef is a Chez Panisse alum -- but as you know, I don't subscribe to hype so I had to actually savor the goods for myself. The menu changes daily and it has a lot more than just pizza. A few things stood out. My favorites were the refreshing and silky halibut crudo with avocado and grapefruit, sprinkled with some red pepper flakes (or marash pepper, according to the menu). The subdued meatiness of the halibut paired so well with the buttah-like nuttiness of the avocado and slightly sweet and sour citrus -- in short, the perfect summer starter. Red pepper flakes injected a slight kick. I also liked the grilled squid salad with cherry tomatoes, red onions, cucumbers and mixed greens like frisee. 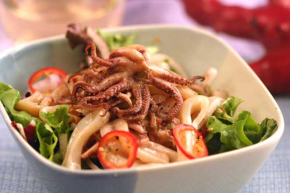 The squid was smoky and soft and made for a great salad with minimal dressing. I should mention I had an interesting nectarine and basil drink to start off, which was good as a mocktail but I'm sure would be great with alcohol. It helped that the complimentary bread was from Acme, one of my favorite bakeries in the Bay Area. Solid, crusty bread that was fresh and came with good quality butter. The fried chicken was a pleasant surprise. Buttermilk fried chicken isn't the first thing that comes to mind when I think Italian. But it was delightfully crispy and the chicken was moist and juicy on the inside. The sides of mashed turnip, stir-fried greens were very comfort food-y, just like the chicken. That crust was really something else. I guess it's the buttermilk magic. My favorite entree was the meatballs, which were so incredibly juicy and flavorful that I almost became a meatballs convert. I've had one too many dense and dry meatballs in my day, but judging from the flavors and textures, we surmised that they must have been made from several kinds of meat such as veal and pork. The tomato sauce it came with definitely enhanced the meatballs without overwhelming them with excessively strong flavors. Other dishes included a mushroom pasta that could have used more mushroom flavor (or mushrooms, for that matter) and my least favorite was the squash pizza, which was a bit bland. The pizza crust was good but the toppings of squash, "pounded parsley" and grana cheese tasted fresh enough but needed something more. I thought the crust was better at Pizzeria Mozza and the pizza toppings combination was better at Beretta. The stir-fried greens with garlic were fine. The desserts were good but not fantastic. The peach ice cream was very peachy and the unusual pine nut tart a la mode was nutty and creamy. The chocolate cake was moist and not too sweet. I wasn't blown away by the desserts but then again, not every place can be like The Bazaar. The outdoor patio was a great space and service was good. I would definitely return to this Temescal area and explore more. I walked by Barlata and other talked-about haunts so will have to check those out. I didn't make it to Zacchary's Pizza in Berkeley so instead went to Little Star in the Mission (it has another branch on Divisadero), which I was told was better. I had the spinach, garlic and tomato deep dish pizza, which was good. I liked the crust better than Zach's because it didn't get too soggy like Zach's. The spinach topping was extremely garlicky and a good two slices were, needless to say, very filling but satisfyingly so. Upon request: I couldn't refuse my first request to review a place, a hole-in-the-wall in Chinatown called Chef Jia's, adjacent to the (in)famous House of Nanking. The honey chili chicken was too sweet and not spicy enough for me. Don't get me wrong. The chicken morsels were perfectly fried and super crispy. But the sauce had far too much honey and not enough chili, so I had to dip (more like dunk) the chicken pieces in the red chili sauce that came in the condiment jar on the table to make them more palatable. The white rice was also not as fresh as it should be, even though I did stop by at an odd hour and it was $5.25 a pop. I actually liked the egg soup the lunch special came with. Now that had a bit of spice and was a good remedy for my almost-cold. Random afterthought: I found that Midi in Union Square area has a decent burger and fries. Bun isn't quite on par but the patty was cooked medium rare with crispy, warm, fresh-out-of-the-fryer fries. Not sure I would return unless I were staying at the attached hotel, but good to know in case of a serious late-night burger craving. All this talk about burgers - whether rice burgers or not - got me craving this supposedly awesome burger at Golden State that J. Gold wrote about. The verdict is that the patty is great but bun needs work. The patty was juicy and perfectly cooked medium rare. The problem was the bun, which was far too dense and unfortunately ended up taking over the burger. Like I've said before, the balance between patty, bun and toppings has to be just right. The burger came with cheddar cheese, bacon, arugula and an aioli and ketchup sauce. Noteworthy is the cozy place offered curry ketchup, which gave the sweet potato wedges an interesting twist. The wedges weren't exactly crispy and there were very few on the plate, but I have a weakness for sweet potato fries so I didn't mind so much. Another reason to check this place out is the beer selection. I discovered that bitter pale ale goes well with a bloody burger. I was always in the "burger and red wine school" of thought, since red wine goes so well with red meat. But this was a great pairing, especially if you're craving for some ice-cold beer after a long day or week. As soon as I was finished with the burger, I could barely drink the beer solo. I also had the potato salad and Jalapeño slaw, which were unremarkable. For instance, the slaw hardly had any heat and the potato salad was pretty plain. I probably don't need to tell you which burger sets the bar for me. Ok, if you must ask, it's the California burger at Houston's, but you knew that if you've been following my harsh burger reviews. So in the realm of all the burgers I've tried in LA, Golden State hovers around the same level as Umami but not quite as high as Houston's, the golden standard (pun intended). I'd return, though, for the beer + burger experience. Plus, the owner said the fish and chips were good and I'm a sucker for that too. If you like tonkatsu, chicken katsu curry or hambaga suteiku, as in Japanese-style hamburger steak, you're in for a treat at Marked5, the latest mobile food parlor courtesy of the post-kogi barbecue truck craze. The twist? It isn't a rice bowl. It isn't a burger either. It's a rice burger! Before you say, What the &%$@, let me assure you that it is a great concept and you will want to try it at least once. So the "bun" is made out of white rice bunched up into patty size rounds to resemble two sides of an actual hamburger bun. The actual "patty" can be any of four menu items made out of beef, pork, chicken and tofu. After a full meal, we ran into this truck as we leisurely walked around Abbot Kinney in Venice. But we had to try it. My dinner mate had memories of Mos Burger in Japan where this rice burger concept first took off. The tonkatsu burger is deep fried breaded pork tenderloin with a touch of the salty, sweet and tangy dark brown tonkatsu sauce and some shredded cabbage. First off, the patty was on the skimpy side. But it was decent although the sauce was on the sweet side. The remedy? Death ketchup, of course! We smothered some Sriracha sauce that was handy and voila, the rice burger tasted like a veritable meal on the go. Think rice bowl without the bowl. Tonkatsu-don on the go! Then we tried the chicken katsu curry, which is deep fried chicken pieces smothered in Japanese-style curry with a bit of a kick. I loved this concept but execution was a bit iffy. The spice level was good enough. No death or any kind of ketchup or condiments needed. And I love rice and curry. While I didn't get to sample them, there is Japanese-style hamburger steak (well done only, meaning you can't have it medium rare, bloody meat-lovers -- yours truly included) and a tofu patty burger. It also offers shrimp chips with lotus roots and shrimp spring rolls, which I didn't taste but looked good. I loved that the truck sold some of my favorite items such as rice crackers wrapped in seaweed, multiple kinds of green tea and oolong tea, wasabi-covered peas and Pocky crackers. Not to mention the Sriracha sauce displayed out front for all the heat you'd ever want to add to your rice burger. The owner said the cooks have some impressive resumes but truth be told, I think it's a tough endeavor because of the sheer nature of deep fried foods. To really savor an excellent tonkatsu and chicken katsu, they have to come straight out of the deep fryer, super hot and crunchy. There's no time to waste on assembly, making sure the rice pebbles on the "bun" don't fall apart. You know there will invariably be calls for brown rice buns or non-fried chicken, etc. But I actually wouldn't mind the regular chicken curry for that reason. I love fried food as much as the next person, but cold fried food just doesn't do it for me. When it's mixed in with the curry, it's hard to bite into and may actually contribute to the rice bun falling apart. It's also not dirt cheap like a taco, at $5 a pop. I'd like to see them succeed, but they may have to tweak some of the items to really hit it big, I think. But then again, I don't even like kogi and look at that craze. You can follow Marked5 on Twitter.